Rating : 9.4 out of 10 based on 132 reviews. 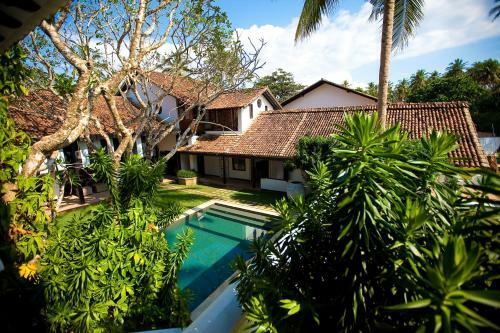 Paradise Road The Villa Bentota offers Economy Single Room,Executive Suite,Standard Room,Superior Suite accommodation in Bentota. Paradise Road The Villa Bentota is 0.73KM from Bentota centre. Economy Single Room Max persons :1 Show Price Please select check-in check-out dates to view the price. Standard Room Max persons :2 Show Price Please select check-in check-out dates to view the price. Superior Suite Max persons :3 Show Price Please select check-in check-out dates to view the price. What General facilities are available at Paradise Road The Villa Bentota? What Activities are available at Paradise Road The Villa Bentota? What Services are available at Paradise Road The Villa Bentota? What is the check-in & the check-out time for Paradise Road The Villa Bentota? Which credit cards are accepted by Paradise Road The Villa Bentota? Eronee Villa is located at Sri Dharmavijayarama Mawatha, Sooriyagoda, Bentota Bentota. Blue Mangrove Villa is located at Elpitiya Road, Adagantota Bentota. Bentota. Ocean View is located at "Ocean View", Robolgoda, Bentota. Bentota. Mangrove Villa - Bentota River is located at Gagabada Watta, Meegama Road Warapitiya, Dharga town Bentota.